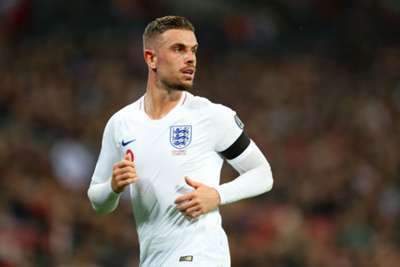 England manager Gareth Southgate paid tribute to Jordan Henderson and his "winning mentality" as the Liverpool midfielder closes in on a 50th international cap. Henderson first featured for England's senior side in 2010, starting alongside Steven Gerrard in a 2-1 friendly defeat to France. Although he had to wait over a year for his next cap, the Liverpool midfielder steadily became a regular in England squads and featured prominently as the Three Lions reached the World Cup semi-finals last year. Henderson has often divided opinion among fans at domestic and international level, but Southgate is among his admirers. The 28-year-old will win his 50th cap if he features against Montenegro in Podgorica on Monday and the England boss commended him for the achievement. "He's such an important player for us, with his winning mentality," said Southgate. "He makes others player well – he's a leader." Henderson acknowledged the looming landmark was a source of pride, though he insisted it is not something he will be dwelling on. "I'm proud to play for my country, but the type of person I am, I'll not really think about it too much," he said. "Maybe I'll think about it when I finish my career, but at the moment I just want to concentrate on doing the best for my team. "When I finish my career or my England career, then I can look back and decide if it was good or not."